I joined the 9 patch swap on this board and I have cut 2 1/2" squares for days and not real sure how or what is the easiest way to keep them all organized by color? Any suggestions would be greatly appreciated. That's a bunch of patches! Sort them into 9 patches and clip together. They will be ready to stitch for a quick project even if you only have 5-10 minutes. The other option is to sort by colors and put 9 in a stack. Pick a square from each stack and chain stitch to complete 9 quilt blocks. Good luck on your quilt! I got some boxes at Ikea that come with divided sections, perfectly sized for 2.5" squares. I have 3 boxes full, and have my stacks divided by color. Sometimes I divide by type... like novelty, Christmas, batik, etc. The boxes are called Tjena, article # 403.954.86. They are only $2.99 each. Be sure you get the divider insert with it. 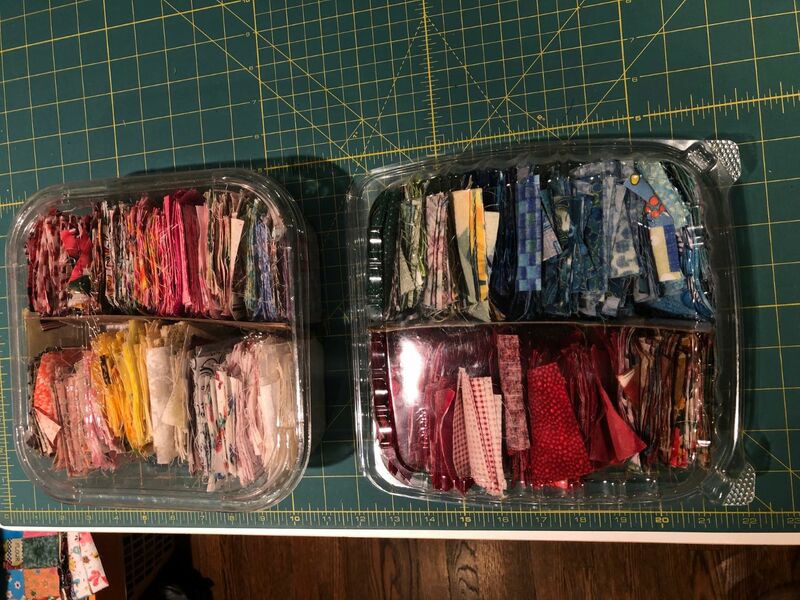 I refuse to ditch any fabric that is larger than 2" square so I have plastic shoe boxes for each cut size of scraps. Of course they are now overflowing. The 2.5" scraps are left in strips if they are over 10" they can always be joined for a scrappy binding, the rest is cut into squares. Until now I've sorted those into light, med (always subjective) and dark, but will be following this thread with interest for ideas for sorting for specific patterns/projects. 2.5 inches seems to be my most popular scrap size...I get lots of scraps from friends and oftentimes bits of leftover binding will come my way. Like Bobbinalong, I leave my scraps in strips. I have a rectangular block pattern that takes 20 inches of one color and 12 or 15 of a contrasting color...sorry can't remember exactly right now. I have been keeping the strips I need for this quilt in a plastic box and soon will have enough for the full size quilt. I have started to divide the colors into brights and country colors (think KT, Jo Morton, CW). Then my scrappy quilts are little more "controlled" What doesn't fit into these 2 categories get another box and become leaders and enders for Bonnie Hunter type quilts. For your 9P's a 10 and a 12.5 inch strip would give you a balanced 9P. SBG...thanks for the Ikea box tip...guess I will have to go online to check it out. So much can be done with 9P blocks! I have a few bins that stack (they are approx 5x10) tucked under my sewing table with 2 1/2 inch squares, one bin has reds, oranges, yellow...another blues/greens etc... I may have gotten them at Target or the Dollar Store. I use the 2 1/2 inch squares as Enders/Leaders and eventually they go into something like Arkansas Crossroads. I like RhondaK’s suggestion about putting them in sets ready to sew. I have mine in plastic shoe boxes from WalMart, only 99 cents each. Haven't sorted by color yet as I am still trying to cut up all my scraps. I fact I have all my blocks of different sizes stored this way. Once I get all my scraps cut (A DREAM I THINK) will either sort by color of pair them up to sew as leaders and enders or maybe just have a big sewing day of the blocks I have cut. That is a ways off yet. Will probably use them for a little quilting guild that makes quilts for pwho lose their homes and possessions to fire. So if anyone has anything they want to get rid of we will welcome it, but have no funds for postage as all of our members are elderly and on limited incomes, It is a struggle to "make do" at times, thus I am trying to utilize what scraps I have for use to them. I just started using the long rectangular cardboard sleeves from plastic wrap and parchment paper. Some are a bit too small and some are too large but I found one that is absolutely perfect! I cut up heavy card stock to use as labeled dividers. Works great! I use ziploc bags. A few get folded but not a hard enough crease to have to reiron. Thank you everyone for your advice. I took some square snack baggies and put like colors in each bag then I put all of the little bags in a large zip lock bag. It didn't take up much room and I can just grab colors when I want to and it is pretty convenient until I get creative and think of something else to do with my squares. that is an idea i never heard before. I can't quite 'see' this. Do you mean that the tubes/sleeves are approx 2 1/2" square and the fabric squares stand up along the length like biscuits/cookies? hmmm you ladies should check out my swap that I just posted for this year. 2.5 " birthday swap. We are getting ready to start another year. Please go check it out. "2019/2020 2.5" birthday swap"
Please read the 1st post should give you all the info you need. or feel free to message me. sewbizgirl...how about another round? WMUTeach is already signed up! Yes that’s what I do. I like that is a rigid container and easier to store. Thank you, I don't use much cling film/plastic wrap so I'll have to see if I can find a similar solution. Solution found! A cereal box with the front cut out. Laid on it's back I can reinforce it by taping around the four sides and then put in some dividers. As I fill more than one box, they will stack easily and if I am feeling really organised I can label the sides for easy selection. Do you think I looked like a mad woman cruising the aisles of the supermarket checking out the sizes of groceries with a tape measure? . . . . no need to answer that!! Thanks for the laugh, Bobbinalong! Maybe not a mad woman but definitely focused! "They're coming to take you away..."
I use them for leaders and enders and make 4 patches, 8 and 16 patches. But I like the idea I read from here about making 9 patches, going to try that with them next. Last edited by love to sew; 02-07-2019 at 06:27 PM. I cant' decide if I am going to store the squares on their backs or on their edges like 'love to sew'. On their backs, separated into different colour stacks, keeps them flat. I can hold the stack to fan through them to choose what I want. On their edges makes it easier perhaps to see individual colours, but do they get creased and fray as they are pulled out and put back? Should we have a referendum on this? The Brits on here will get the humour in that I guess! I took a tape measure to the dollar store and bought some boxes that hold the different size squares and triangles that I use then I organize by color or project. They fit nicely on my shelves. Yes, plastic produce containers. I prefer the kind without attached lids, but they are easy enough to cut the lids off if necessary. Make sure you wash them very well, but Not in the dishwasher. They will warp and be unusable. I love that they are free, do not wind up in the landfill, and they are see-through. I organize mine by color as well as by value, trying to range from light to dark as it looks like love to sew may have done as well. I love the idea of the cardboard strip to make the squares behave themselves! I like this one best as it has two snaps to shut and they hold a boatload of 2.5" squares. I have one for 2.5 x 5" bricks, one bin holds 2" strips, another HST etc. I have more than one of these rolly carts and keep each quilt project in a bin so all things are right at my finger tips. I can roll them from machine to machine and everything is right at my fingertip.